In here, Minister Do Van Chien has visited the showroom, cultural activities, economic exchanges and integrated market of ethnic minority people in the area. 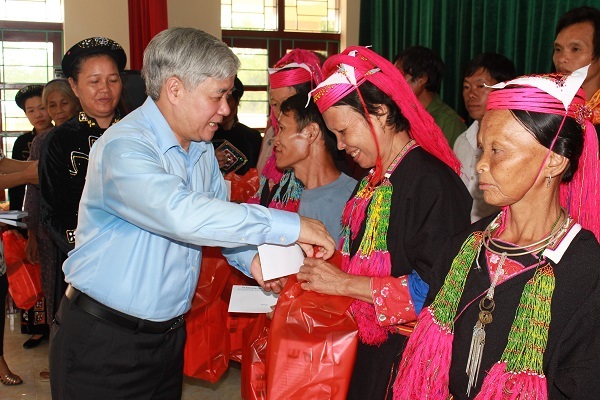 Minister and Chairman Do Van Chien has visited and worked with Ha Lau commune – which is a commune of extremely difficult situation of Tien Yen district and gave 40 presents to ethnic minority households in difficult circumstances of the commune. 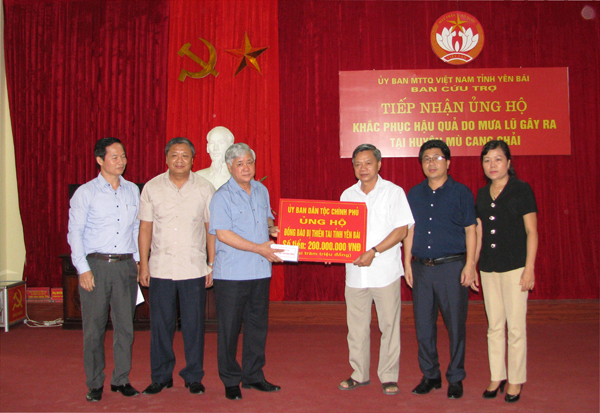 In the quick report to the Minister and Chairman Do Van Chien at the meeting, Party Secretary, Chairman of People's Council of Ha Lau Commune Ly Van Dieng said: Ha Lau is the only 135 commune of Tien Yen district. 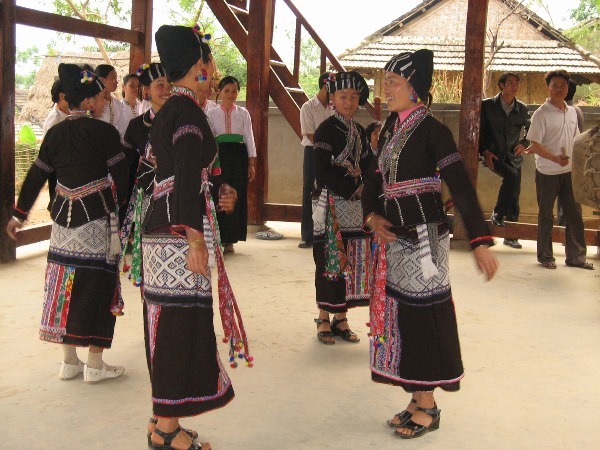 The commune has 510 households, with 2,458 people, including 2 main ethnic groups (Dao 70%, Tay 30%). The natural area is wide, the terrain is divided, people live sparsely and scattered on the hillside, the average income is 8 million VND / year, the rate of poor households (end 2016): 131 households, equaling 26.33%; the nearly poor households: 133 households, equaling 25.94%. At present, there are still 8/12 villages with special difficulties. 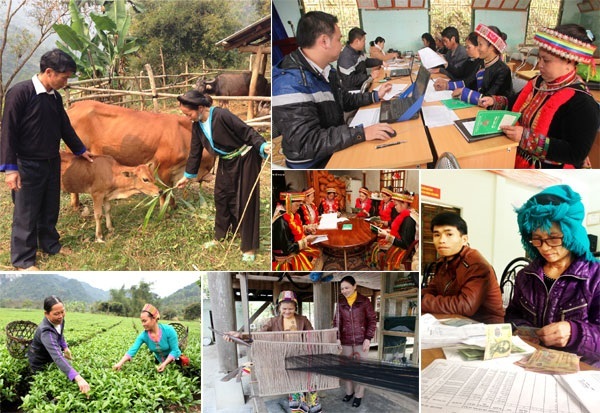 Implementing the guideline of the Party, the Government, CEMA and the direction of Quang Ninh, Ha Lau is trying to develope the advantage of wide area, creative many ways to restructuring the economic, focus on promoting the development of the program one bird (Tien Yen chicken) and one plant (medicinal plant). At the meeting, Mr. Dieng also made some suggestions: The Party should continue to pay attention to improving policies to support production development and production development loans for ethnic minorities; policies on ethnic minority cadres and staff; policies for ethnic minority students; policy on development assistance, preserve the cultural characteristics of ethnic minority people; policy on attracting investment enterprises and development cooperation in mountainous ethnic minority areas; Continuing to mobilize social mobilization sources to help hamlets and communes in ethnic minority and mountainous areas. Speaking at the meeting with cadres and representatives of poor ethnic minority people in the commune, Minister and Chairman Do Van Chien has expressed his exciting for the results has been achieved by the Party, government and people in the commune. The Minister said that Ha Lau has captured three main strengths of its land are large, fertile, have great labor to invest in developing the right direction and Quang Ninh province has policies to support satisfactory. However, according to the Minister and Chairman Do Van Chien, Ha Lau need to research some more models of planting and raising animails, to enrich the model of economic development, promote all the available local strengths. "I really hope that people of Ha Lau could to do three things. First, under any circumstances, solidarity is the number one. Second, no matter how hard it is, the children have to go to school but not drop out. Thirdly, the Party, the State, the gratuitous support, the support also, but not forever, so you have to try to rise in business. In my opinion, you need to try two things. Households has already known how to do business, then try to get rich to support the poor, and those who are poor must try to work production and save, to get off the poverty "- Minister and Chairman Do Van Chien emphasize. The Minister, Chairman Do Van Chien expects leaders of Ha Lau commune to make a high determination in directing and leading local people to develop their production, raise their incomes and living in order to get off from the 135 sustainably.